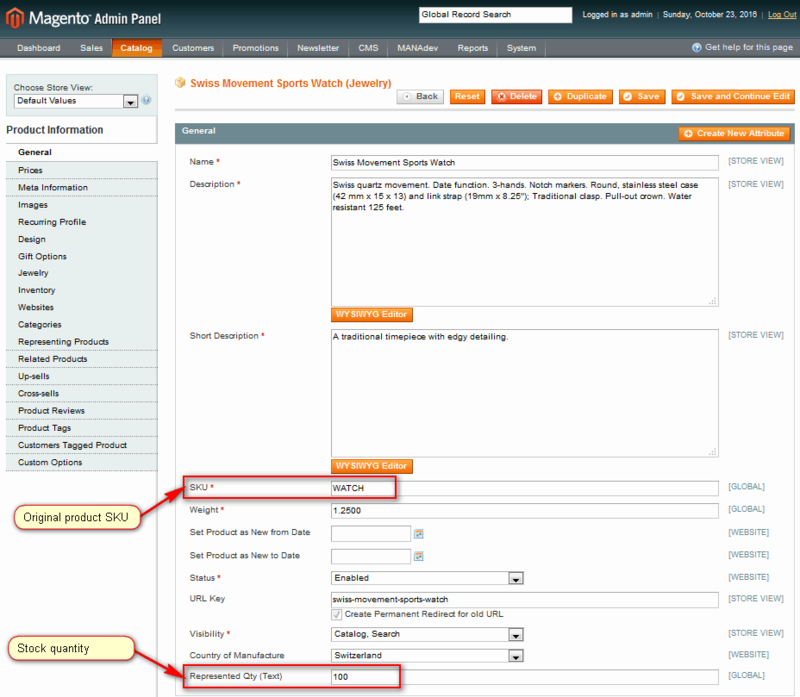 In order to access product configuration, go to menu Catalog -> Manage Products in Magento Admin Panel. After clicking a product in product list, new window opens with product configuration. In General tab check a SKU of a original product. It will be used for representing product identification. New field Represented Qty (Text) appeared after extension installation. It is used for exporting to external systems. Enable Multiple Representations of This Product. While not enabled, standard Magento inventory management handles stock of this product; once enabled, you can distribute stock qty of this product between several products including this one. No - standard Magento inventory management is used. Yes - possibility to create representing products. New fields are shown. Override Existing Product Attributes. Used when adding already existing product. Not used when cloning. If set, attributes of an existing product added as a representing product will be overridden (if confirmed). Total Represented Quantity shows total quantity of all represented products without possibility to modify. SKU - SKU of original or represented product. SKU for represented product is generated from original product SKU by adding suffix and sequential number. Hyperlink leads to represented product configuration. Name - name of original or represented product. Hyperlink leads to represented product configuration.